Two Sundays ago, a member of my ward engaged me on the old question of the Great Mormon Novel. We were interrupted before we could finish our conversation so I wrote him an email. (You’ll note references to that conversation in the first couple books mentioned.) But hey—why not send it to you all as well? The main difference between the email and this post is that I’ve added Amazon links since I’ve already promised to lend my copies to someone else. Looking for those links, Amazon suggested some other books I might have liked to add to this list. Yup, Amazon. You’re right. I missed a few. You should all feel free to fill in the gaps down below. Hello, J*****. Here are some books I can lend you. My criteria were: Written by a Mormon. About Mormons. Very good. That was it. Mothers, Daughters, Sisters, Wives by Karen Rosenbaum. This is another collection that might be a novel but it’s a little further away from noveldom than the last one. But of course you should read it because you know Karen and because she is an amazing writer. I can give you a copy of this one too because I bought a copy and then she gave me one. I haven’t finished it yet, so it’s not officially on this list, but hey. Karen. 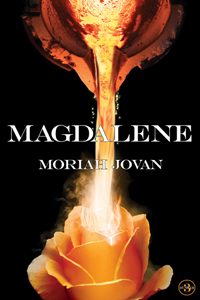 Because of my connection to Moriah Jovan’s Magdalene (I edited it), I’ve been loathe to promote it on AMV (even if I did think it was the best Mormon fiction of 2011). But now that it’s been out over a year, I feel less worried about images of impropriety. And the book is again on my mind for a pair of reasons. Author thmazingPosted on 09/17/2012 Categories LiteratureTags magdalene, Moriah Jovan, Tales of Dunham2 Comments on More on Magdalene. Theric and I are pleased to announce nine more works — and the final set of works — that we will be including in Monsters & Mormons. Everyone who has submitted should now have a decision in hand. If not, email us. But I’m pretty sure we’ve replied to all of our ~70 submitters. Thanks again to all those who sent something in. It was fun reading everything, and we do wish we could find a way to accommodate every work. But editing time and page count and the parameters of the anthology mean we had to make choices. Some tough ones even. The poem “Water Spots” by Terresa Mae Wellborn — the kind of poem that gets under your skin. And then thrashes around. The short story “Pirate Gold for Brother Brigham” by Lee Allred — A classic ghost tale featuring Brigham Young and the Great Salt Lake. The short story “Bokev Momen “by D. Michael Martindale — Mormonism filtered through the eyes of aliens to humorous effect. Although how the abducted Mormon feels about that “humor” we shall not comment upon. The novelette “Allow Me to Introduce Myself” by Moriah Jovan* — A demon-fighting Mormon nun with some nifty gadgets. The short story “The Mission Story” by Bryton Sampson — What happens when your weird mission companion has a bit of the mad scientist in him? The short short story “A Letter from the Field” by James Paul Crockett — the first letter home from an elder assigned to quite the unusual field of work. The short story “Baptisms for the Dead” by Christopher Birkhead — a missionary companionship keeps working through a zombie apocalypse. The short story “Out of the Deep I Have Howled unto Thee” by Scott M. Roberts — A haunted motorcycle in the Utah desert. For those keeping track that brings us to 29 works and 30 contributors. Depending on how edits go, the whole thing will end up being between 160,000 and 175,000 words (not counting bios/forewords/afterwords). All of it Mormony, Monsterish goodness. We’ll keep you updated. And now, it’s off to work. *So in the interest of full disclosure, Moriah Jovan will be doing the layout and formatting on the book. She also runs the publishing concern of which Peculiar Pages is an imprint. I can tell you that neither she nor Theric gave me any pressure on accepting the story, and they both know that I would have had no problem rejecting it. But I do like it, and it does fill a need — so it’s going in. Theric would like to add that, in fact, no one was more enthusiastic about this story than William. Moriah considered withdrawing it and I was about to let her but William refused. And he was right. This story — like every other story listed in today’s announcement — fills a vital need. And now, finally, we feel complete. And boy oh boy but are these tales going to slap you around. Cue your excitement. In Part I of my interview with Moriah Jovan, she provided overview of the electronic publishing market as it currently stands as well as some of the overall issues the e-books market is facing. Here in Part II, we get in to e-books in the Mormon market as well as a some advice for authors and publishers and some prognostication. Every Sunday, I see both men and women using smartphones or PDAs to read scriptures and lesson manuals. The Church actually does a decent job of providing electronic versions of some of its materials. Do you think e-books could sell in the Mormon market? Why or why not? What types do you think would do best? AMV has already touched on electronic publishing in Theric’s post Those LDS Ladies of Indie Publishing and other comments here and there. Today, I bring back Moriah Jovan, one of “them LDS Ladies,” for a more in depth look at e-publishing. In Part I, MoJo provides an overview of the field plus an in-depth look at some of the e-publishing publishers and storefronts that are committing to the format. In Part II, we’ll take a closer look at the LDS market and some other issues. BTW: the links below are to provide specific examples of e-publishing endeavors (which are very important at this early stage in the field’s development and a major part of why I approached MoJo with this interview request). They do not necessarily constitute an endorsement of the editorial choices of the various publishers and booksellers. Could you provide a brief overview of some of the key issues with electronic publishing with some links for people who want to do further reading? 1. Formats. Too many, with too many variables for too many devices, and no *real* universal format. EPUB is getting there, but I think PDB (eReader) is going to become a serious contender.